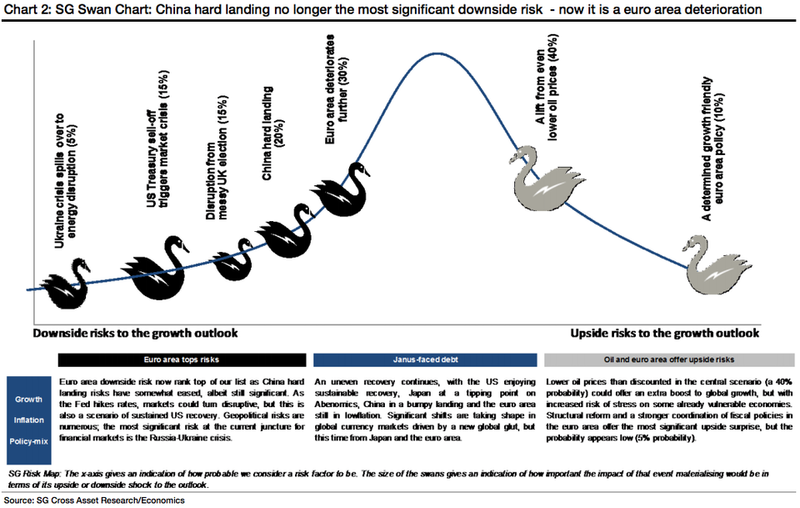 Societe Generale is out with its latest quarterly chart of “swan” risks. 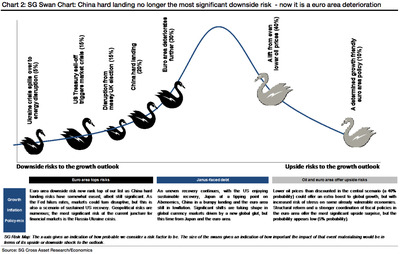 “Black swan” events are those that have a low chance of actually occurring, but could seriously rock the economy and the markets if they do occur. Although China hard landing is still a significant downside risk, it’s no longer the biggest one. Now, with a probability of 30%, the further eurozone area deterioration is what has the potential to really upset the markets, according to SocGen. “Geopolitical risks are numerous; the most significant risk at the current picture for financial markets is the Russia-Ukraine crisis,” according to the report. “While a lower oil price is an upside risk to growth, on the flipside it may intensify some of the geopolitical stress. We place a 40% probability on oil prices shifting to a new low to average $US70/b in 2015. Much will depend on OPEC… and the next meeting is on 27 November,” according to SocGen. Check out the all swans below.